“Her art is wonderfully childlike and harmonious. You could say that Niki de Saint Phalle brought her dreams to paper. But even if the colorful works radiate happiness, her artistic career’s beginnings were by no means carefree…” Read more. “Niki de Saint Phalle: Spiel Mit Mir” will be open to the public through 3 June 2012. Learn more about the exhibition. 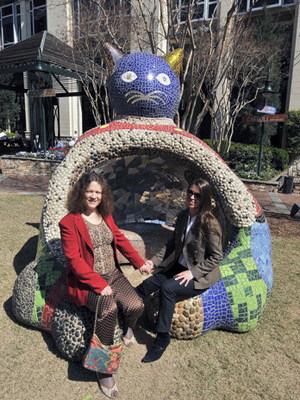 On Thursday 1 March, Niki de Saint Phalle’s daughter Laura Duke (at left in this photo) will join Jana Shenefield, archivist at the Niki Charitable Art Foundation, for a live Q&A on Niki’s life and work in southern California. The event, which will be held at Here is Elsewhere Gallery in West Hollywood, comes to us courtesy of be-Art and Yann Perreau, curator of the current HiE exhibition “Niki de Saint Phalle and the West Coast.” The exhibition, Niki’s first show in Los Angeles in a decade, examines Saint Phalle’s relationship with the Nouveaux Réalistes (including Jean Tinguely, Arman, and Daniel Spoerri) and her work in Southern California, from her 1961 “shooting paintings” in Malibu to her “Black Heroes” series realized in the late 1990s in San Diego. Thursday’s Q&A will take place from 6:30 to 8:30 pm at HiE @ B 231 Space in the Pacific Design Center in West Hollywood (8687 Melrose Ave # G102, Blue Building, Second Floor). There will be a cover charge of $20 per person. To attend, please RSVP via email at com.be.art@gmail.com. The exhibition itself will run through 23 March. “As victims, I choose my paintings,” said French artist Niki de Saint Phalle, who would suspend balloons of paint or beer cans from her artwork and shoot at them. The bullets would splatter the paint and puncture canvases. 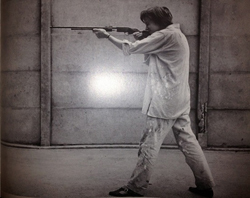 Saint Phalle, who died in 2002, held shooting sessions in L.A. 50 years ago and, in her honor, 11 contemporary artists chose their own victim artworks and went to Angeles Shooting Range on January 22 to open fire. You can see the shot-up art  such as a roughed-up, tar-colored statue by Henry Taylor and red-splotched KKK villains by Noah Davis  at Here Is Elsewhere Gallery. Also on display: a gorgeous wood altar Saint Phalle built and then assaulted in 1962. Pacific Design Center Blue Building, 8687 Melrose Avenue, Suite B-231; through March 23. (310) 904-8966, hereiselsewhere.com. “Her art is wonderfully child-like and harmonious. You could say that Niki de Saint Phalle brought her dreams to paper. But even if the colorful works radiate happiness, her artistic career’s beginnings were in no way carefree…” Read more. 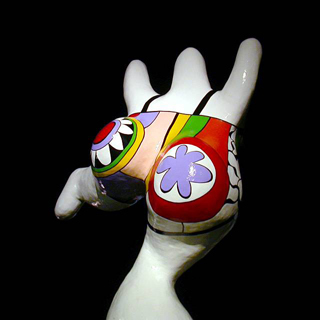 “Niki de Saint Phalle: Spiel Mit Mir” will be open to the public from 15 January to 3 June 2012. Learn more about the exhibition.